was born in 1962. He received his diploma degree in electrical engineering with an emphasis on data processing, computers and digital networking in 1990. 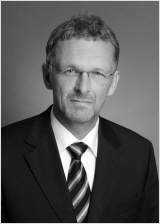 He worked at the Association of German Liability, Accident and Motor Insurers (HUK-Verband), Munich as chief network supervisor until 1994. Since then, he has been working in the field of intellectual property in the firm and passed the examinations for German and European patent attorneys in 1999. He has been a full partner of the firm since 1999.